3Q18 PATMI and Revenue were in line with our expectations. NIM rose by 2bps YoY but contracted 2bps QoQ due to the intensive build-up of fixed deposits in the third quarter. Key earning drivers were loans growth and fee income. Loans grew 9% YoY, driven by broad-based growth across industries and countries. 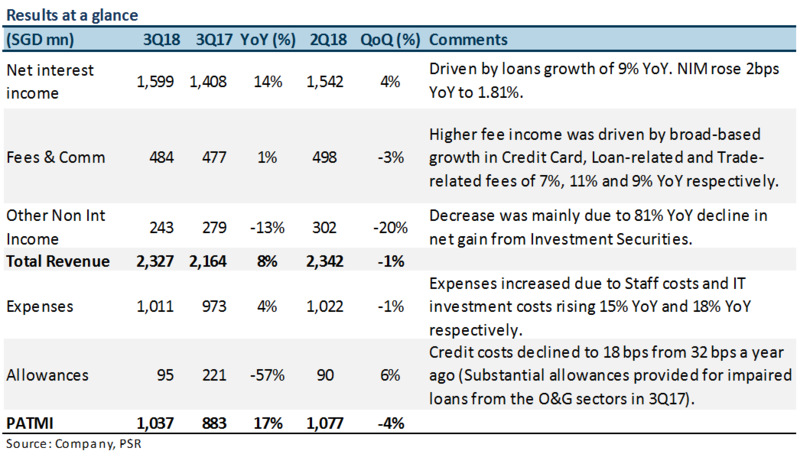 Credit costs improved to 18 bps (3Q17: 32bps) due to the absence of problematic O&G sector loans. Maintain BUY with target price of S$32.50 (previous TP S$33.70). We derived our revised target price following our earnings adjustments, based on the Gordon Growth Model. + Net interest income grew 14% YoY. Loans expanded 9% YoY, driven by loans to financial institutions (+25% YoY) and Greater China (+23% YoY). Property related loans remain the largest slice of pie at 50% of total loans, but growth is expected to slow in the next few quarters due to property cooling measures. + Lower credit costs at 18bps, as compared to 32 bps a year ago. This decrease is due to the absence of substantial allowances for impaired O&G sector loans in 3Q17. New NPA formation remained around c.S$400m per quarter this year. NPL rose 12% YoY while NPL ratio remained stable at 1.6% (3Q17: 1.6%). Assuming the current benign environment remains unchanged, coupled with the possibility of recoveries, the management’s credit cost guidance of 20-25 bps is reasonable, and we put in our credit cost assumption at 20bps. + Higher dividends still in the picture. UOB maintains its 50% payout guidance, subject to a minimum CET1 ratio of 13.5%. 3Q18 CET 1 ratio stands at 14.1%, giving UOB the capacity to award shareholders with higher dividends. We put in our dividend forecast at S$1.20 per share, giving us a dividend yield of 4.8%. + Cost-to-income ratio remains stable at 43.4%. Operating expense grew 12% YoY due to higher staff costs (performance-related bonus) and IT-related expenses while operating income increased 8% YoY. CIR is in line with management’s guidance of c.44%. To trend towards a c.40% CIR in the next few years, UOB indicated that it is a two-pronged approach: both interest margins and cost efficiency has to improve. – Funding pressure as UOB bulks up on time deposits; NIM contracted 2bps QoQ. 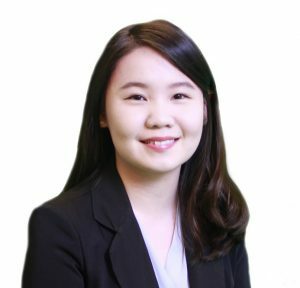 In anticipation of higher interest rates, regional volatility and year-end competition for deposits, UOB has been strengthening its capital and funding position by bulking up on mainly SGD time deposits to meet projected business (SGD LDR lowered to 75.5% as compared to 76.9% a year ago). Total deposits rose S$6.1bn QoQ in 3Q18, of which S$7.0bn came from fixed deposits (other deposits decreased by S$2.3bn). Fixed deposits spiked 4.7% QoQ as compared to the average fixed deposit growth in FY2017 of 1% QoQ. With the bulk of deposits raised being pricier fixed deposit, this could result in a squeeze in interest margins, albeit in the near term. NIM expanded 2bps YoY due to a favourable interest rate environment (Singapore’s NIM expanded 8bps YoY, while Indonesia’s and Greater China’s NIM contracted 25 and 13 bps YoY respectively). Efficient utilisation of this war chest of funds remains to be seen in the next quarter. – Net fees and commission income was flat YoY. 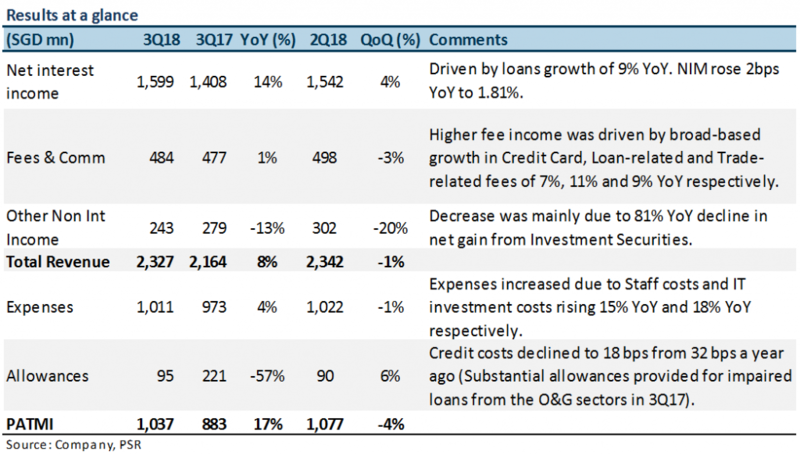 Fee income improved slightly due to loan-related, trade finance and credit card fees which grew 7%, 11% and 9% YoY respectively. However, the improvement was offset by lower wealth management fees that fell 7% YoY as investors’ appetite for financial products turned more cautious. Expect loans growth to remain on target. With the build-up of stronger funding base to lock in their funding position, UOB intends to deploy these funds up for loans growth. Furthermore, assuming the current trade war situation does not take a drastic turn for the worse, the trade war is not expected to pose significant risks to trade loans growth (however, slower transaction volumes is likely in the near term). This is because the bulk of UOB’s loans book is anchored out of the SEA, with the majority of belonging to Singapore (52% of total loans). If the trade war escalates further, UOB might even benefit from an increase in regional trade as compared to the US and China (as companies turn to SEA as an alternative in their supply chain). Rising interest rates still a key factor. Majority of UOB’s loans book is pegged to floating rates, and as interest rates increase, UOB will be able to reprice its loans. Near-term competitive pricing might result in a squeeze in margins, but NIM should improve as UOB gains more pricing power with the rise in interest rates.